Project Jacquard "connected clothing" is coming later this year to solve an obvious problem I see among several coders at Google IO 2016. Look at anyone at this developer conference still wearing Google Glass and it immediately tells you about the inability of "fashion and technology to work as one." There is "inherent tension between the two," says Dr. Ivan Poupyrev of Google's experimental ATAP division. He leads a team to solve to solve a problem he calls "interactive textile technology." Google ATAP, known for its Project Ara modular phone, is working with Levi's on clothing, as was announced last year, and it's not going to be smart pants, unlike the concept clothing. The very first Jacquard garment is going to be a Levi's trucker commuter jacket with sensors built right into the black jean fabric. 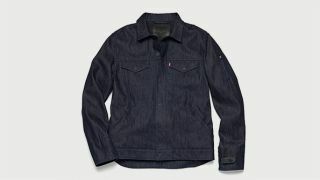 Google and Levi's are targeting urban cyclists with this tech-infused jacket, calling it a fashionable, function garment. "It's a terrible idea to navigate the screen of your phone while navigating busy streets" says Paul Dillinger, VP of innovation at Levi's. "Anyone who ride a bike knows that tension." What can it do? Well gestures, taps and swipes on the sleeve could help you change music or get directions through haptic feedback. Dillinger calls it a "co-pilot for your ride and your life." Project Jacquard's debut jean jacket is going to be a beta later this year. Just let that one sink in for a moment. We'll have more news from Google IO and ATAP's experiment projects later today, as the company just announced that its modular smartphone project will release at the same time as Project Jacquard.